Through the Eyes of an Intern, No. 1: Introductions! /Hawks Aloft Inc. Through the Eyes of an Intern, No. 1: Introductions! Hello! My name is Mirinisa Stewart-Tengco (please call me Miri) and, in case you haven’t read the latest HAI Flier, I am the intern for this summer. I am very excited to be able to experience all the different facets of this wonderful organization. L-R: Aires (Swainson’s Hawk), Aztec and Bubba (Great Horned Owls), and Commodore (another Swainson’s), who all introduced me to my first day of work. I also had the opportunity to visit a lot of the education birds…and clean their cages, of course! 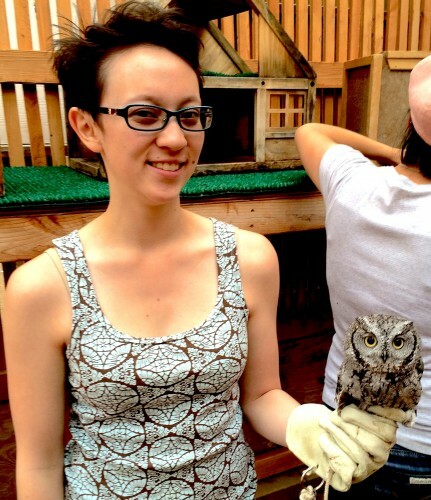 I don’t know if I’ll ever be able to quite get used to taking rat and quail remains off of their mats, but if it gives me the chance to hold birds like the adorable Shadow (a Western Screech Owl, pictured below), then hey, it’s worth it. As you can see, we take multiple precautions to make sure our birds stay safely under our control—safer for the birds, of course, but also safer for the spectators nearby. One of the scariest moments for me so far was during cage cleaning, when we had to grab the water dish from the red-tails’ mews; they are already some of the most aggressive birds that we have and, as they were nesting, it was unsafe for us even to attempt to clean the rest of their enclosure. Luckily, most of our raptors are friendlier! 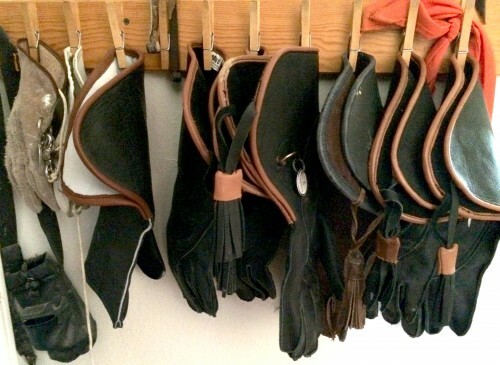 Handlers’ gloves for the birds kept at Gail’s house. In the second week I had my first taste of field work, a morning of nest checks in the Bosque. I’ll talk about that in my next blog, by which time I will have gone out another time or two and will be able to give you a better insight to field work in general. I also will be assisting with my first educational program this Thursday. I have little experience in education, so stay tuned to see how this goes! Though, seeing as that cutie Shadow is one of the birds we’re bringing along, I’m sure the program will go well.